A novelty item, for sure, this Walking Stick will be the start of many a conversation. 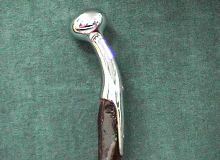 Made from the reproductive organ of a bull and reinforced with a 5/16 inch steel rod that traverses from tip to tip, this cane is durable and built to use. 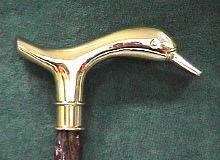 The handle is available in brass in a variety of styles. 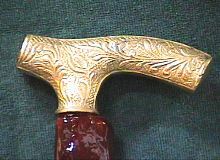 An Indian head penny comes with the cane, giving it an Old West feel. Canes can be made from the reproductive organ of a bull or buffalo. Join ranks with the likes of the men above. Carry a piece of the Old West with you when you do the town. Display in your office or home. There's no doubt that this walking stick will be the start of many interesting conversations! Our walking stick is a Ross Taylor Original. It is equipped with a non-slip rubber tip. 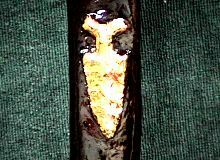 Please specify the length of the cane in inches in the Comments Section of the Order Form and we will custom make your cane. You must specify a length or your order will be put on hold. 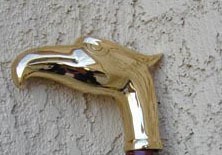 If you want your cane personalized, please type the person's name in the Comments Section of the Order Form. Please verify the spelling. There is a $10 charge for personalization.